Sempra Generation will join the pantheon of solar power plant developers who’ve gotten government aid. The U.S. Department of Energy on Wednesday announced an offer of a $359.1 million loan guarantee to Sempra to build a 150 MW project using solar panels in Arizona. Sempra is planning to build the solar farm, called Mesquite Solar 1, about 45 miles west of Phoenix and will sell the electricity to Pacific Gas & Electric Co. Through the loan guarantee program, the DOE promises to pay back loans if project developers can’t. Sempra, which still has to finalize the paperwork for closing the loan guarantee, expects to get the loan itself from the Treasury-run Federal Financing Bank, said Sempra spokesman Scott Crider. Counting the Sempra project, the DOE has offered loan guarantees to 11 solar power plant proposals since it began reviewing applications in 2009. The program so far has supported more power plant projects using solar technologies than any other renewable energy sources. Just yesterday, the DOE announced it had offered nearly $2 billion loan guarantees to 2 solar power projects of 250 MW each. Sempra plans to use solar panels from Suntech Power for the Mesquite Solar 1 project, Crider said. Suntech, incidentally, has a factory in Arizona that can assemble 50 MW of solar panels each year. The company also will use a newer type of inverters – which turns the direct current from solar panels to alternating current for feeding the grid – that uses liquid cooling. Advanced Energy will supply the inverters. Back in 2009, Sempra was the first power wholesaler to deliver solar electricity to PG&E as part of the utility’s effort to boost its renewable energy purchases to meet a state mandate. 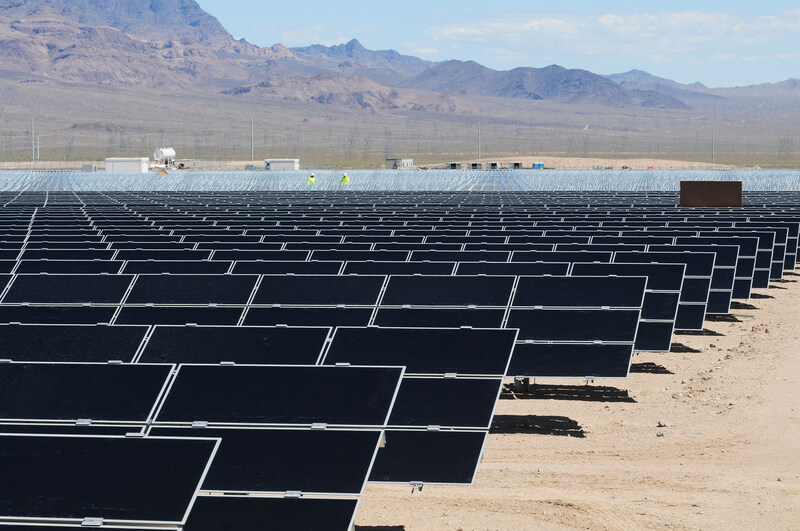 Sempra completed a 10 MW project in Nevada then using solar panels from First Solar (s FSLR). PG&E subsequently signed another power purchase agreement in 2009 for another 48 MW farm, which Sempra built next to the 10 MW project in 2010. The 48 MW power plant, which also used First Solar’s panels, is the largest in the U.S. that uses solar panels. Sempra signed a power sales agreement with PG&E to sell electricity from the Mesquite Solar 1 project last year. The power producer will start construction later this month and plans to complete the solar farm in 2013, Crider said. Mesquite Solar 1 is the first phase of Sempra hopes will become a 600 MW solar farm one day.